Where the laser pointer opens. Lasers, we do love our lasers! From the classic Red, to the bright Green, to the sneaky, changing Violet we love the fact that we can have such a unique pointing device in our hands. Once upon a time laser pointers were pretty much a high-cost luxury item. Back in the very late 80’s they could cost around $75-100 dollars for a simple red pointer that was nothing special. It was handy for those who had to do a lot of pointing work, but other than that it was a bit too much for most people to spend on a toy. Then came green laser pointers. At first they were very expensive: A basic model cost around $500 in 1999. But like the red models they soon came down in price, although they never quote reached the $5 level of the red models, they certain became more affordable. Now a green laser goes from $30-$150 depending on who is selling it. Green lasers are bright enough that their beams can be visible under night conditions, so they are even used in astronomy to point towards objects in the night sky. These days a third color of laser pointer has entered the fray (ignoring the very expensive ‘True Blue’ models, mind you). This is the 405nm wavelength Violet/Blue laser pointer. 405nm is not as visible as the 532nm Green Laser pointers, but 405nm does have other advantages. It is a wavelength that has industrial uses, and since it is a wavelength that is verrry close to the upper end of the human eye’s spectrum it actually is almost in the Ultraviolet spectrum. This has many uses, but one of the most interesting effects with how the human perceives the beam point. If it sits on a bright, white surface the point appears to be one color, but aim it at a not so bright, white surface and it appears a different color. This is an effect similar to what happens when you point an ultraviolet light at piece of bleached white clothing. Would you like to buy some laser pointers? Additional Note 8/26/14: Sadly this product has been discontinued by the manufacturer. There were some reliability issues but we feel they could have been solved. We are sorry to see this item go. We were stunned when we first saw this little geek gadget. It just keeps on delivering goodies! 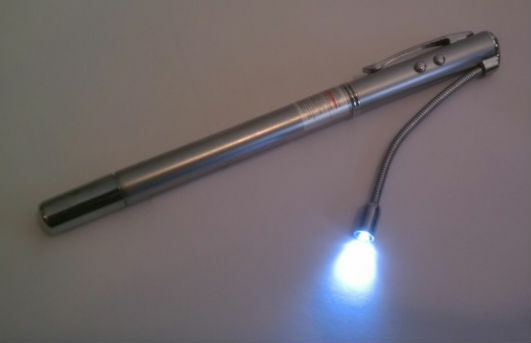 Its the 7-in1 Laser Pen and that title doesn’t even begin to describe how much this little pocket sized tool can do! So far, it seems simple. Of course, it is in the description, so we are certainly going to have a laser pointer in this thing. And we do. A class IIIa 650nm laser pointer is at work here. Great for any purpose you might need a laser pointer for, which means pointing things out to friends or making cats go crazy. Now of course, with all these gadgets and parts the old joke comes back about the watch with so many features it doesn’t have room to show what time it is. 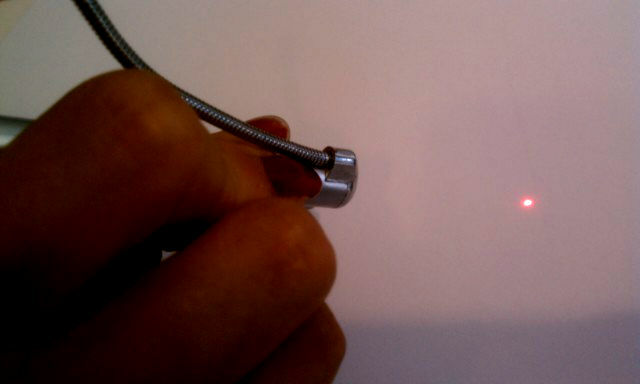 That reason is that the cap is part of the pen’s extending magnetic pick up wand! At full extension (this is not show at full extension) it is over 17″ long and the magnetic cap can pick up any ferrous item that isn’t too heavy for it. Here we see it holding a flat watch battery (it was all we could find). That’s quite a list of features! But wait, you want more? Well we did say this was a 7-in-1 Laser Pen, and so far we only have five. Well if you unscrew the central body you get this! What doesn’t this thing have? A PH00 Philips-Head screwdriver! (You’ll have to take our word for it…this picture didn’t come out as well as we might have liked). 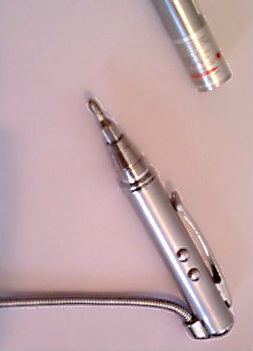 The Laser Pen has other features as well, such as a metal body and a sturdy pocket clip. The laser is FDA approved and all the lights run off 3 x AG3 batteries, the batteries are most certainly included! 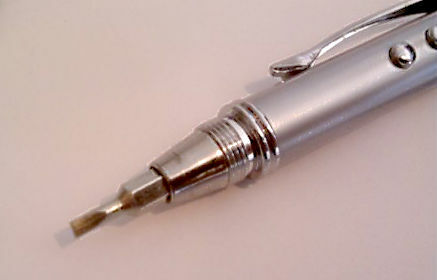 Grab one of these awesome little gadget pens today! We have recently added KHET to our product lineup! Khet has been around for a while but was always a bit on the expensive side. But the makers of Khet have now realeased Khet 2.0, which is a much more affordable game! Like the best strategy games, Khet is very easy to learn but hard to master. Each side is given a special ‘Sphinx’ laser piece that ‘fires’ when you press it’s head. You also have several mirror ‘pyramid’ pieces, a couple of ‘Scarab’ pieces with mirrors on either side, a ‘Pharoh’ piece (which acts as the ‘King’ of the game to be protected), and a ‘Anubis’ piece that is used to block the laser. Players take turns positioning, rotating, and firing to try and illuminate the opponents Pharoh. Sounds easy? It is, but the possible reflections and positions make for endless possibilities int he game. You can even change the startup positions of the pieces at the beginning of the game to make for a different experience! Khet is an excellent strategy game that works on the principles of optics. An option game addition can be obtained that turns the ‘Scarab’ pieces from mirrors into beamsplitters that send 1/2 the light through and reflect the remainder. That makes a huge change in the tactics of the game!